Once again the Monument to Forgiveness is a huge hit at NSU. It is quickly becoming one of the most photographed locations on campus. Thank you for returning it to the most appropriate location, great to spend with you! A 13-year, more than 800-mile journey ends in northeastern Oklahoma for a monument to forgiveness. 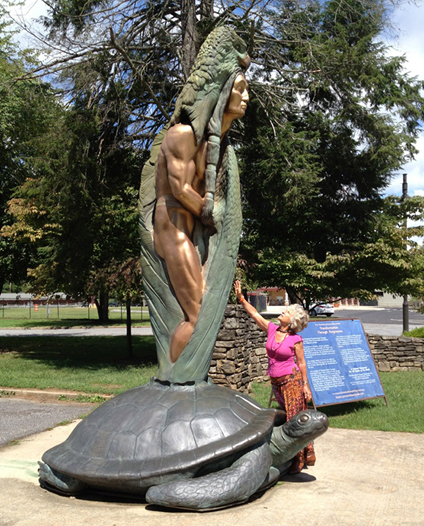 “Transformation Through Forgiveness,” a 14-foot, two-ton bronze replica of Francis Jansen’s “Eagle Man,” arrived at Northeastern State University in August 2011, but it went to the start of the Trail of Tears in Cherokee, N.C., in 2002. It’s returned to NSU permanently, which Keetoowah Band Chief Joe Bunch said is appropriate. Braving the morning humidity, about 100 people gathered Monday for the “second unveiling” of a towering sculpture at Beta Field on the campus of Northeastern State University. 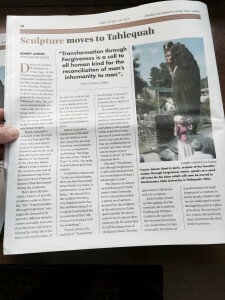 The “Monument to Forgiveness,” which had stood before at NSU during its peripatetic past, was unveiled at its final stop during a ceremony attended by the sculpture’s creator, Frances Jansen. TAHLEQUAH — Northeastern State University will host an unveiling ceremony for a donated statue created to inspire reconciliation for suffering Native Americans endured during the Trail of Tears. The ceremony for the statue, Monument to Forgiveness, will be held at 10:30 a.m. June 20 at the south end of Beta Field on NSU’s Tahlequah campus. A sculpture that left the Northeastern State University Tahlequah campus in 2002 will be returning and placed in its permanent setting in the coming months. 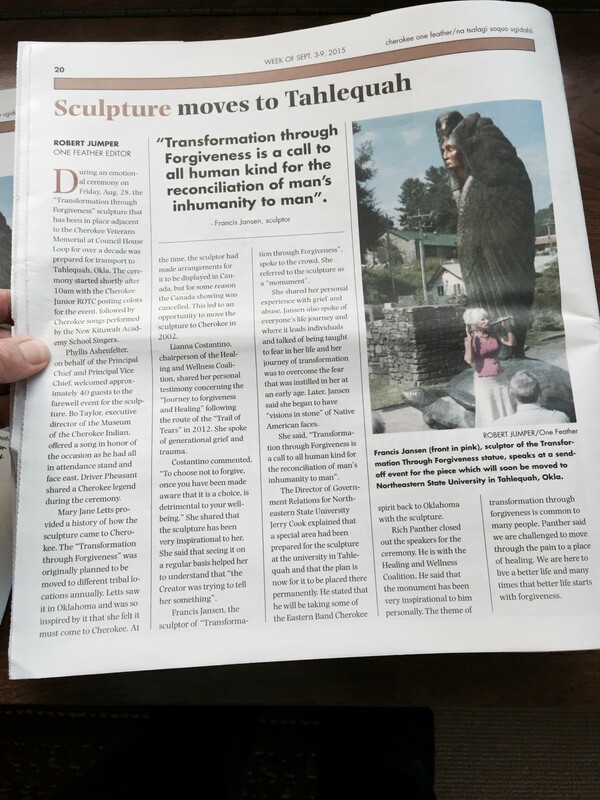 “Transformation Through Forgiveness” is a 15-foot bronze sculpture created by Francis Jansen as “a gesture of encouragement to consider forgiveness.” It is a replica of a marble “Eagle Man” she created out of a elongated piece of marble from a quarry in Italy. Jansen, who was born in Holland, said she had a vision when she first saw the marble block.